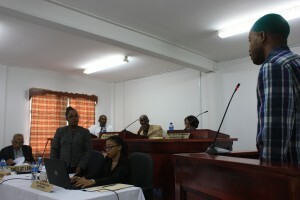 Thirty-nine-year-old Michael Lewis has told the Commission of Inquiry (CoI) into the Camp Street unrest that prisoners at the state penitentiary are treated like beasts. According to Lewis, if an inmate becomes ill it is not until after a loud ruckus is started in the prison to attract the attention of the “Chief” that the prisoners are allowed to go to the prison infirmary. Otherwise, they are just told to “hold on” by whichever officer would be on duty at any given time. “If you feeling pain and you tell the officer you feeling sick and you want to go to the infirmary and the officer would tell you hold on and sometimes you holding on for a whole day until the officer change and you tell the next officer he say hold on,” said the murder accused. “Porridge and sometimes bare tea and tea bag, bare tea is tea without tea bag, water with sugar sir. Some Wednesday morning we would get bread,” he said later adding that lunch consisted of cook up with chunks. “Sometimes you barely see couple strands of meat in the food,” said Lewis. He however indicated that since the Commission of Inquiry started there has been some improvement and now prisoners can actually see the meat in their meals. 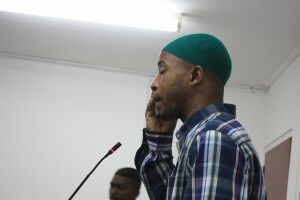 Bursting into tears while on the witness stand, Lewis also declared that no aid came from the police officers and others in the prison compound at the time of the fire that claimed 17 lives. Still fighting tears, he recounted stepping over bodies and fighting for a hole to breathe clean air.